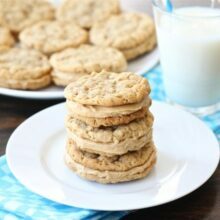 Soft Peanut Butter Cookies – these easy peanut butter cookies are the BEST! The cookies are super soft and filled with peanut butter flavor. These will be your new favorite peanut butter cookies! I bake a lot of cookies. And when I say a lot, I mean A LOT! I love creating new cookie recipes, but I also love baking the classics. Last weekend, I was in the mood for good old-fashioned peanut butter cookies so I made my favorite Soft Peanut Butter Cookies. 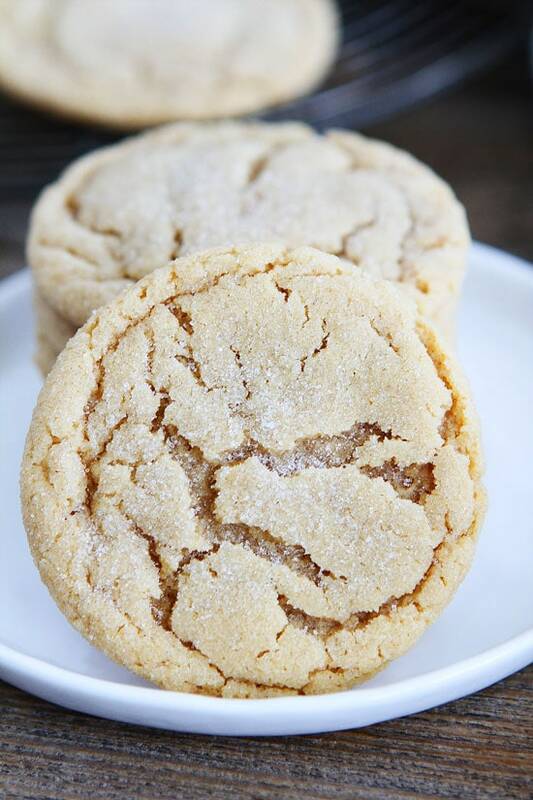 I’ve been making these peanut butter cookies for years and every time I make them I fall in love all over again. They are seriously the best peanut butter cookies. They are super soft, chewy, and have the perfect peanut butter flavor. 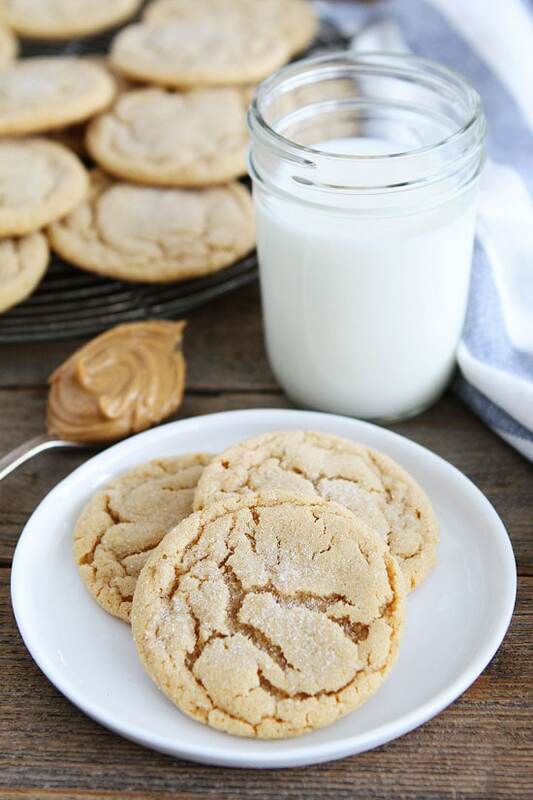 If you are a peanut butter cookie fan, you will love this recipe for peanut butter cookies! 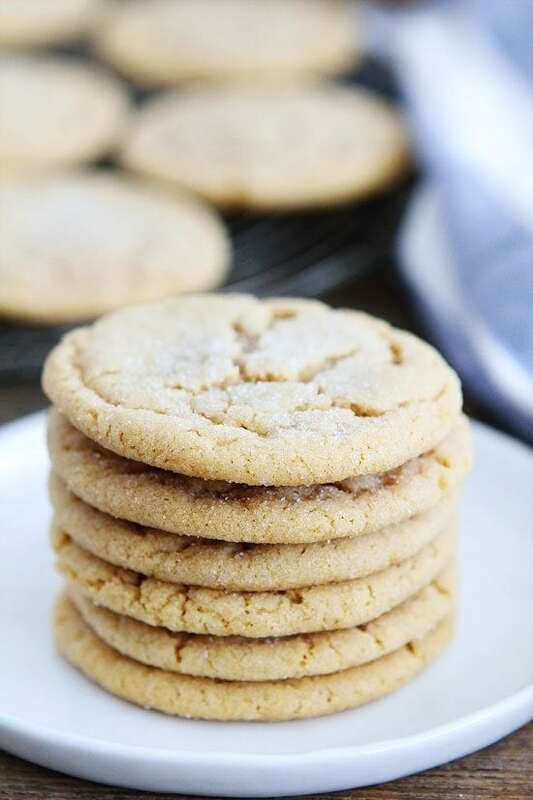 The recipe for these soft peanut butter cookies is simple and I bet you have all of the ingredients in your pantry right now. Unless you polished off your jar of peanut butter late last night like I did. I got carried away with the pretzels and peanut butter. It’s one of my favorite late night snacks and I have a hard time stopping once I start. Just like I can’t stop eating these peanut butter cookies once I start! They are so soft and chewy and practically melt in your mouth. I can never stop at one…or ten:) They are the BEST peanut butter cookies! 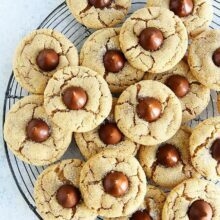 I use creamy peanut butter for these peanut butter cookies. Make sure your butter is soft, but not melted. If your butter is too warm the cookies will be flat. Make sure you really cream together the butter, peanut butter, and sugars. This will take about 2-3 minutes using a stand mixer on medium speed. Roll the cookies in sugar before baking to make them extra pretty! Don’t overbake the peanut butter cookies. Remove from the oven when they are set around the edges but still soft in the center, about 9-10 minutes. The cookies will finish baking as they cool on the baking sheet. You want the cookies to be soft! Store the peanut butter cookies in an airtight container on the counter for up to 4 days. To keep the cookies soft, place a piece of bread in the container. The bread will get hard but the cookies will stay soft. It is magic! Peanut butter is on my grocery list today! 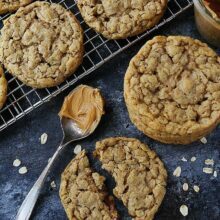 I need to stock up so I can make another batch of these peanut butter cookies! They seriously are the best! And make sure you try my Peanut Butter Cookie S’mores! They are my favorite summer treat and a fun way to enjoy these perfect peanut butter cookies! These peanut butter cookies are super soft and the BEST peanut butter cookies you will ever bake! Preheat oven to 350 degrees F. Line a baking sheet with a Silpat baking mat or parchment paper and set aside. In a medium bowl, whisk together flour, baking soda, baking powder, and salt. Set aside. Using a stand mixer, cream the butter and peanut butter together until combined. Add the sugars and beat until creamy and smooth, about 3 minutes. Add in the egg and vanilla extract. Mix until combined. With the mixer on low, slowly add in the dry ingredients. Mix until just combined. Take about 2 tablespoons of dough and form a cookie dough ball. Roll in granulated sugar, if desired. Place cookies on prepared baking sheet, about 2-inches apart. Bake the cookies for 9-10 minutes or until they are golden at the edges and just set. Don't overbake, the cookies will set up as they cool. Remove pan from oven and let cookies cool on the baking sheet for 4-5 minutes. Transfer to a cooling rack and cool completely. Wow these seriously do look like the BEST peanut butter cookies ever!! I fear that my waistline won’t like your recipe as much as my tastebuds will haha! Yum! What brand PB do you prefer? I grew up using Jif or Skippy so I still use them. It’s a nostalgic thing:) Use your favorite brand! 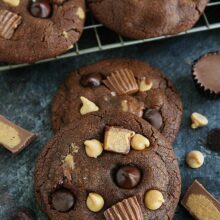 I’m going to use Peanut Pan Peanut Butter for these cookies, my all time favorite! I did an informal poll in college, asking guys their favorite PB and every single one picked PP over the other brands. Making these for my husband tonight. Maybe he’ll be less cranky then. Ha. Ha! I hope he likes them! These look great! Love peanut butter cookies so much! I too have the same problem with eating pretzels and peanut butter too, its a great snack! So hard to stop though eating though haha. Pass me a plate of these! 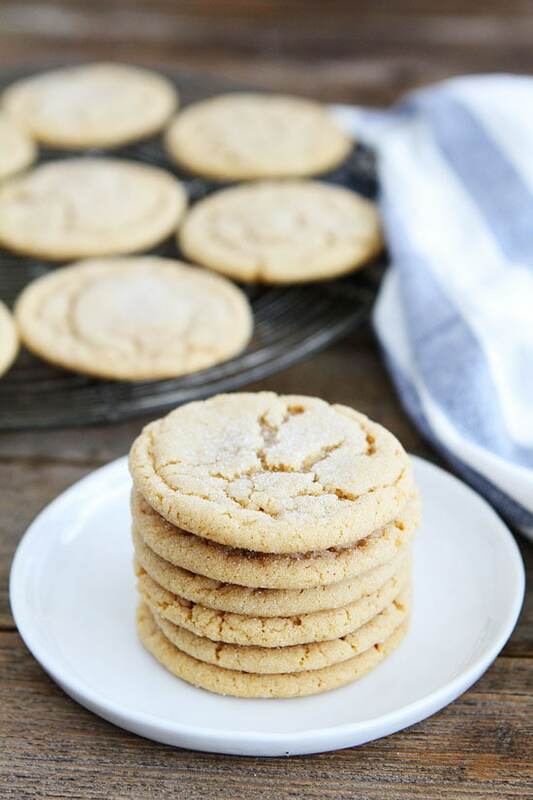 truly I could eat an entire recipe of these- they are just perfect peanut butter cookies! Thanks Heather! They are dangerous! These really do look perfect. And delicious! Well these look fantastic! Who could resist a plateful of these? I totally need to try your recipe! If you wanted to double the recipe would you double everything? The best kind of cookie is a soft cookie…looks delicious!! I live for cookies AND peanut butter, so these are everything! These look so perfect – soft and chewy! These pb cookies look divine! I like how they are a little different from the usual and they look so soft and chewy! Perfection! Yum! I think I am incapable of saying no to peanut butter cookies!! These look so good! I miss peanut butter. (My son has a severe peanut allergy.) Maybe I will try them with Sunbutter. Thanks for another great recipe. My mouth is watering! I feel like every peanut butter cookie I eat is hard and crunchy, which of course I like, but sometimes I prefer a soft cookie. My husband is especially a fan of the soft cookies in any form so I will definitely be trying this recipe. Thanks for sharing! Classic cookie recipes like this are the best!! You know they must be good if they’ve stood the test of time. I made these today and they are delicious. Came out looking exactly like yours did. I love your website and recipes Every new recipe I try turns out great and finds itself in my cooking/baking routine. Typically when making peanut butter cookies, you gently press them criss-cross. Yours have the nice crackled look. Did you just leave them balls when putting them into the oven? I added chocolate chips to min and they are in the oven now. Taking much longer than 10 minutes for some reason. They are puffy and not flat. They smell divine though and I’m sure they will taste so. I made these over the weekend and they are to die for! I think my 2 tablespoons per cookie was more like a “heaping” 2 tablespoons because I only got about 20 cookies and needed to cook them for about 5 extra minutes. They flatten out nicely and look beautiful! Are baking powder and soda interchangeable? I mean, can I use a full teaspoon of one if I don’t have the other? I think they don’t have baking soda in my country/city. Uh. I’m willing to eat this every single morning from now on to the day i’m on the safety heaven. This is absolutely incredible! Baking powder can be substituted for baking soda but it will affect the taste. Perhaps baking soda is known by another name in your country? It’s also known as sodium bicarbonate. Thank you for these! I’ve tried about 100 recipes for PB cookies and haven’t been able to find “the one.” Until now. These turned out perfectly and have won a spot in my recipe box. My husband and kids thank you, too ;). Trying these today! They look delicious. I followed the recipe, but they didn’t flatten out the way they look in your pic…. what could’ve gone wrong? I made these tonight and substituted 1/2 cup crisco and 1 teaspoon water instead of butter and rolled the balls very lightly in sugar in the raw, which has larger crystals that give it a sugary crunch. I used creamy grocery brand peanut butter, but my favorites are any honey peanut butter of skippy! My cookies were also not as flat as pictures but still adorable and delicious, my batch made 28 little soft and sugary peanut butter cookies! I made these cookies for my husband tonight. He is a major peanut butter fan & these were such a HUGE hit that my family ate the ENTIRE batch! I ended up making another batch & didn’t mind one bit since they are so simple to make. I used Peter Pan Honey Roasted peanut butter…Amazing!! Thanks soooo much for sharing!!!! Definitely a keeper! If I need these cookies for 2 day from now, can i make the dough now, and refridgerate and bake the day of? I am officially getting rid of every other pb cookie recipe I have! I am NOT a good cookie maker but these turned out PERFECT!! I added mini chocolate chips to my second batch & they were delicious too!! Thank you thank you! I made these yesterday, but they didnt turn out soft. Can you use crunchy peanut butter? These were amazing! Thank you so much for the great recipe! I have read so many posts on the topic of the blogger lovers except this post is truly a pleasant post, keep it up. My favorite late night snack is peanut butter and pretzels too!! But I stud it with chocolate chips once I dip my pretzel. Seriously so good!! I haven’t made peanut butter cookies in years so I made them last night and they were delicious. I love how chewy they were. We also made the s’mores cookie sandwiches out of them…now I’m ruined, haha!! I followed the recipe precisely. They took far longer than 9-10 minutes to bake, and did not flatten out to make nice crackled looking cookies. They just look like dough mounds. I didn’t even want to eat the. My favorite cookie on this site were the chewy lime and coconut, but these definitely took me back to when i was little visiting my grand. Soooo good!! Maria, would you say these last well in an airtight container for a few days? Also, do you bake one sheet at a time? Has anyone tried adding chocolate chips to these? Ha!! Glad they were a hit! I made these last week and I’m going to make them again! I followed the recipe exactly for my family of four and I can sum this up in three words… What. A. Hit!! Made these using smooth Barney butter almond butter and followed recipe exactly and baked for 9 minutes. 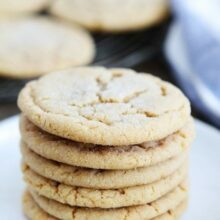 If you feel your cookies aren’t flat enough, you can sort of whack your cookie sheet on the counter when you take the cookies out of the oven (not too hard but hard enough so they crack a little on top) This recipe really brings out the flavor of the nut butter you use and it is truly a winner! I wanted a soft cookie with rich nutty taste and not too sickeningly sweet, and thank God we found it!!! Thank you! I use your recipe atleast once a month and send everyone I know here because these are truly the BEST peanut butter cookies!! I inadvertently bought reduced fat creamy PB. Is it okay to use for these cookies? I have made these cookies so many times and they are to die for! Nobody can ever stop eating them. But – I have a friend who is vegan and would love if she could try these. What do you think about substituting oil or vegetable shortening for butter in this recipe? There is vegan butter available in most US grocery stores, now. (Earth Balance, I cant believe it’s not butter vegan, etc). Don’t forget that vegan people don’t eat eggs either, so you have to make a flax egg. I follow Minimalist Baker’s instructions for that. Cookies with peanut butter are always my favorite!! Love the peanut butter cookie s’mores idea! These look amazing — that rich color in the cracks makes me want to bake these today, lol. Thanks for sharing! You are welcome! You need to try them! We love these. Please never lose your website because I’d seriously cry if I couldn’t find the recipe again! This is a keeper recipe. So much so that I printed if off and put it in my “Family Favorites” notebook. I also pinned it but I wanted a hard copy just in case the website ever went away. I’m wondering if the baked cookies freeze well. I often bake in November and freeze for Christmas, and would love to add this one to my holiday platters. I will certainly try these!!! this is really awesome post, actually best thing is loved all of your pictures which you clicked. I made these for the first time last night and they are truly some of the best peanut butter cookies I’ve ever had. I will definitely make them again. Thank you so much for this recipe! Hands down, the best pb cookies I have ever made or eaten! Josh you should add to your post about Wade, and the video, to grab a tissue. Such sweet sentiments for him from his fans. Thank you Maria for the discount for the built bars, I have been seeing good reviews for them, and a few people at my WW meeting said they were good too. Yummy cookies, peanut butter, looks like I’m making some too!